23 year old, Hasnain Shaikh was born in Bombay, lived in Bangalore, but was brought up on the stage. As the son of Dr. Zulfia Shaikh, the founder of the Bangalore School of Speech & Drama, he discovered his passion for theatre and was imbibed with the love of the ‘word’. Throughout school, he experimented with writing and performing prose, poetry, spoken-word poetry, and stand-up comedy. In 2011, at the age of 17, he made his debut with his first play Perspectives written and directed by him, which at the time graced him with the title of ‘Bangalore’s youngest playwright'. Perspectives enjoyed four sold out shows over two runs, and met with great reviews by both the media and the audience. 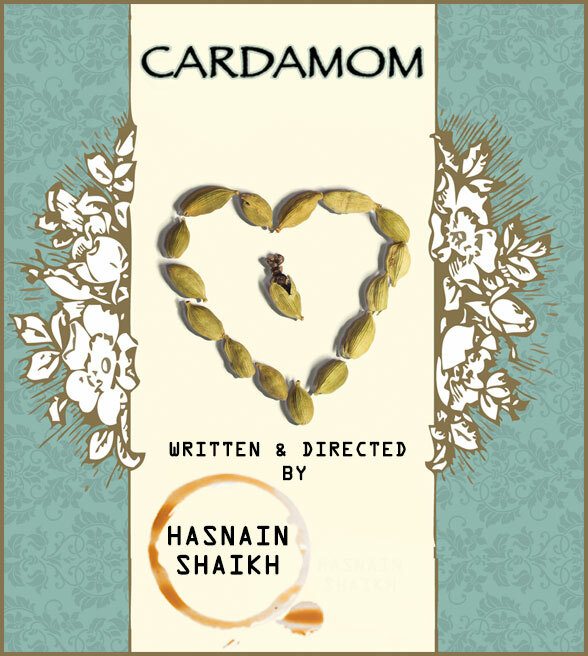 Having finished his undergraduate education from the University of Illinois at Urbana-Champaign, Hasnain brought to the stage his second play, Cardamom, which also played to four full houses at Jagriti. Cardamom, is back by popular demand and sure to leave the audience with laughter pains and, maybe, a few things to think about. When the Shankar's decide to cohabitate with their soon-to-be in-laws a week before the wedding, they scarcely imagined the difficulties of such an arrangement. The two progressive families are thrilled to undertake the wedding, but soon discover that there exists convention in the act of being unconventional. Cardamom is a comedy, set against the backdrop of an Indian wedding and showcases every bone-rattling speed bump along the way. The play is an uproarious take, on the peculiarities of Indian families, the plight of the tinder generation, and changing the landscape of morality in India. Jagriti is a Performance Arts space dedicated to Theatre, Music, Dance and Comedy. Founded in 2011 by Arundhati and Jagdish Raja, the space has hosted several productions from India and around the world. A 200-seat theatre, built around a full-thrust stage, it is fully equipped to cater to both artistes and audience. The main stage is designed for intimate performances, with adjoining spaces for informal lectures and gatherings, and an attached restaurant- 'The Fat Chef'. Jagriti is owned and operated by the not-for-profit ART Foundation, a registered charitable trust. The Rooftop - above the main auditorium is an open-to-sky space with a staging area that can accommodate about 50 people. A raised and walled off platform can work as a perfect area for puppet theatre. The Rooftop has a restroom and a pantry. The Terrace - alongside the auditorium, the Terrace can accommodate about 20 people as an informal gathering area. Lumbini - extending out from the foyer, Lumbini has a stage and an open-to-sky terraced space for about 80 people. Thank you for subscribing our newsletter. Our executives will get in touch with you shortly.